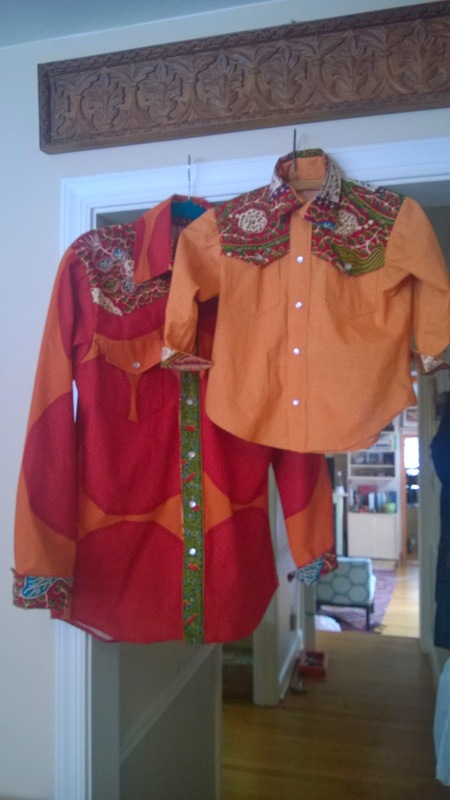 First up, 2 western (African) shirts, made for a friend & his little boy. 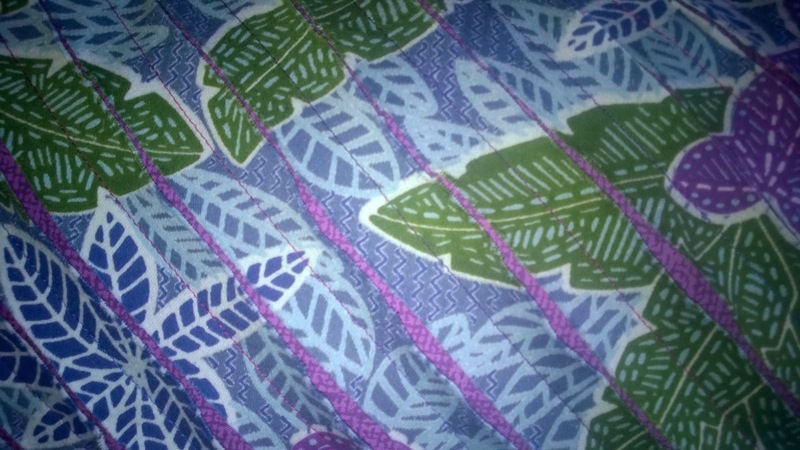 Both are from vintage patterns, and the contrast fabric is from my stash from our trip to West Africa. If you've been paying attention, or even if you've tried not to, you know that last summer we finally got our sun room fixed up. As we sit by our gas fireplace, looking out at another 8" of snow, we are feeling pretty pleased with ourselves! Others are complaining about the late winter weather, but having a gas fireplace makes it all okay! 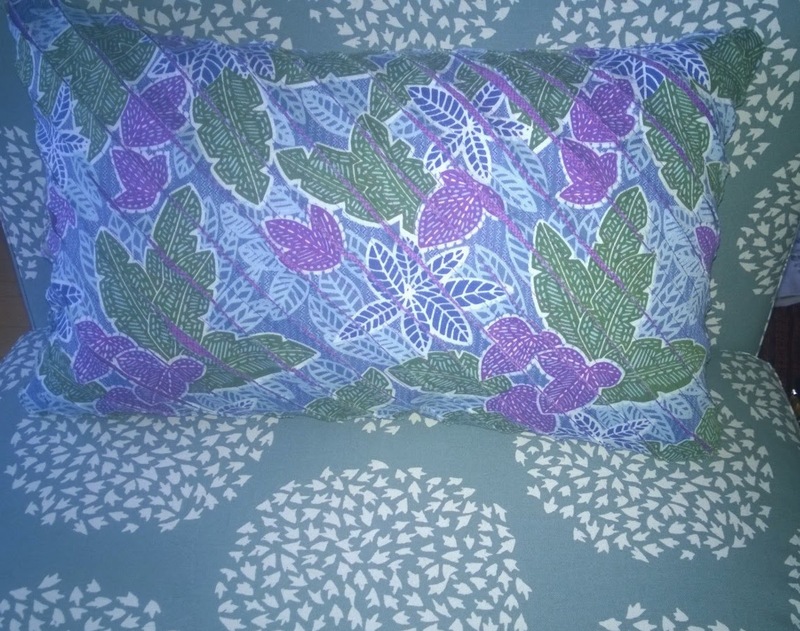 So here's the detail of the other cushion...I just sewed diagonally every inch, then slashed between that sewing, to show the fabric underneath. And here's the cushion, sitting on the other "slipper" chair. 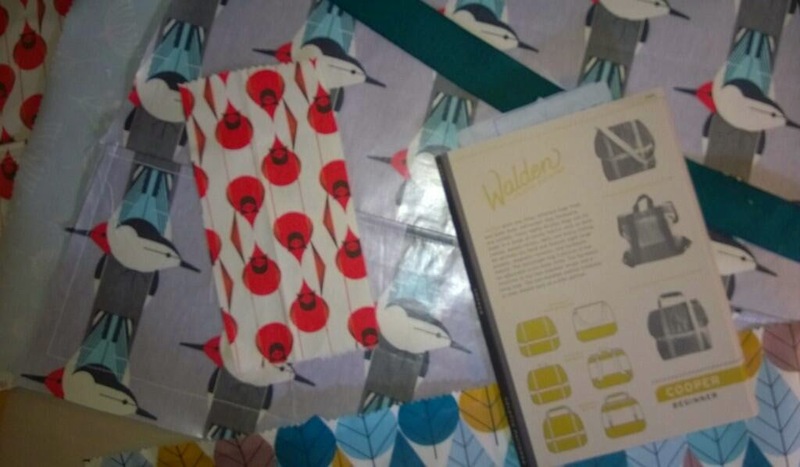 I have made at least 5 other cushions, with a few more in the planning stages. Cushion making is a lot of fun. I can try out a new technique, use up some cool fabric that I don't have much of, or play with some color combinations. I was trying to show a colleague my West African wax print quilts that I made shortly after our trip to Burkina Faso, Togo, Ghana & Cote d'Ivoire in 2006. And realized that I have mentioned them but never put them up on this site. The Roommate had 2 snow days last week (I had none! ), so he took some photos for me. Thanks, Honey! So, we did our last big backpacking/overland trip for 5 weeks through West Africa. Last because we're getting pretty old to be lugging backpacks around and sitting on buses for hours, staying in places with shared baths, etc. We've done that all over the world, partly to stretch our travel & souvenir-buying $$, but also because riding buses (not renting a car & driver) and staying in hostels is a great way to see how the local people live. We don't cover as much ground and certainly travel inefficiently, but on the other hand it's a great way to find out what's happening, plus watch some wonderful Nigerian movies on the bus, and get off and do bird-watching every time the bus driver takes yet another unscheduled break. We are usually the only non-locals on the bus, always of great interest and high entertainment value, plus people are generally quite friendly and curious about who we are and what we are doing there. Reverse of African Fabric Shop. We knew we wanted to buy as much kente, kuba, bogolon textiles, and wax print fabric as we could carry on the plane (about 40 lbs/each). So we took old clothes and shoes that we left behind, and just stuffed our backpacks! We used a scale in a little neighborhood market to check & were thrilled when we got to the airport & checked in with 79 lbs! 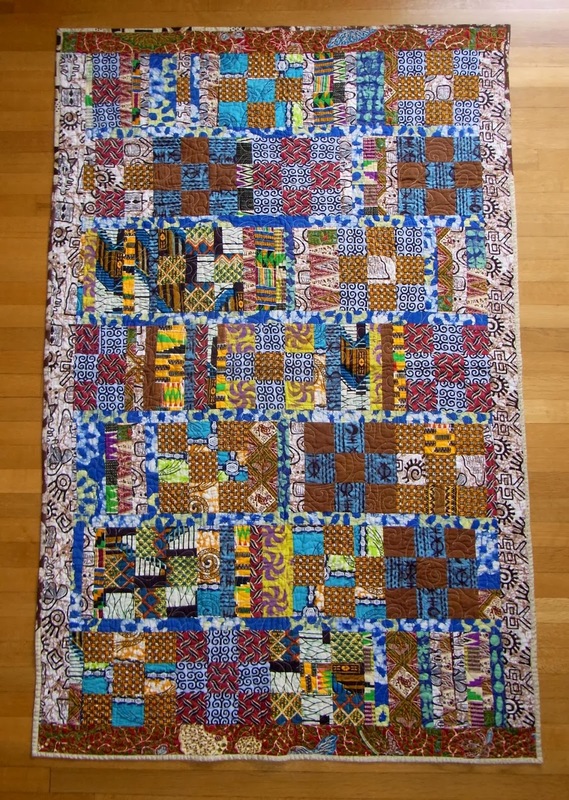 Reverse of African Market quilt. We've spent time in markets all over the world (we love them, in fact, and go out of our way to be in town on market day), but found them to be so crowded that you spent the whole time worrying about being pick-pocketed. Also, they are HUGE, so it's really hard to find what you want; i.e., the textile stores! When we finally found the fabric section in the Accra market, we discovered that the prices weren't that much better, and the selection wasn't any different in the less crowded, well-organized shops a little bit out from the city center. Speaking of fabric shops...they were wonderful. (A few photos here.) Clean, organized, & often with marked prices--a real luxury. 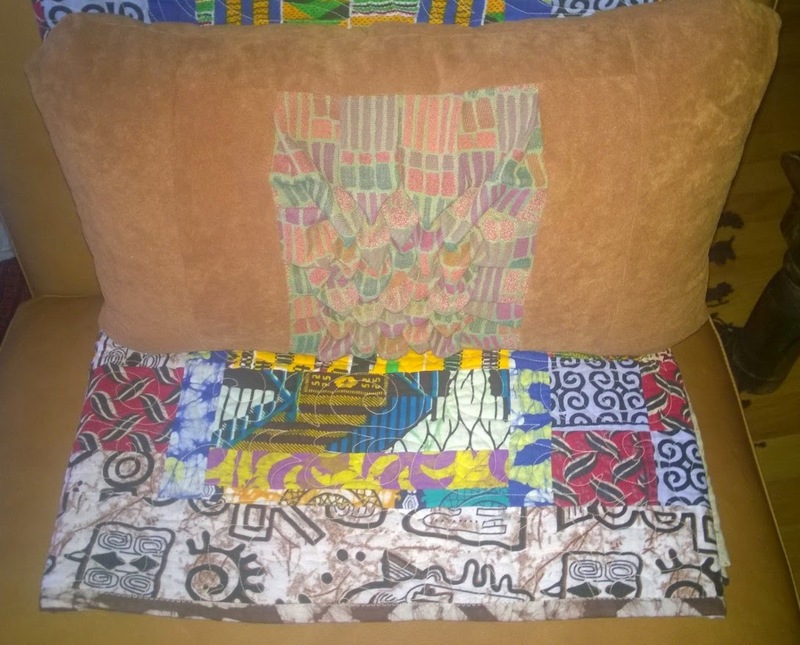 So the second quilt I made is called African Fabric Shop. 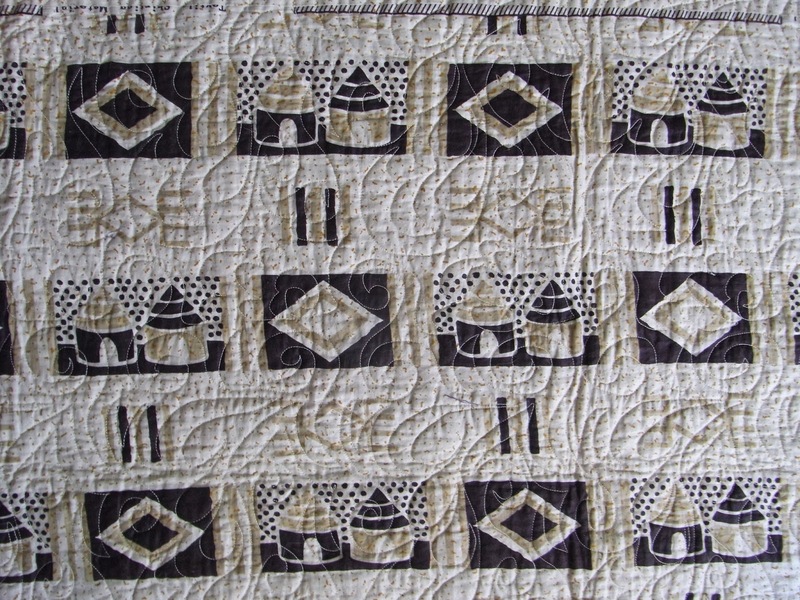 I used pieces of all 44 fabrics I bought, (as I did with the Market quilt), but tried to make them a bit more orderly. Both of these quilts are smaller (3' x 4' or so), and we use them all the time in the sun room when we're reading or watching a movie. Bella also loves them, which is really all we care about. 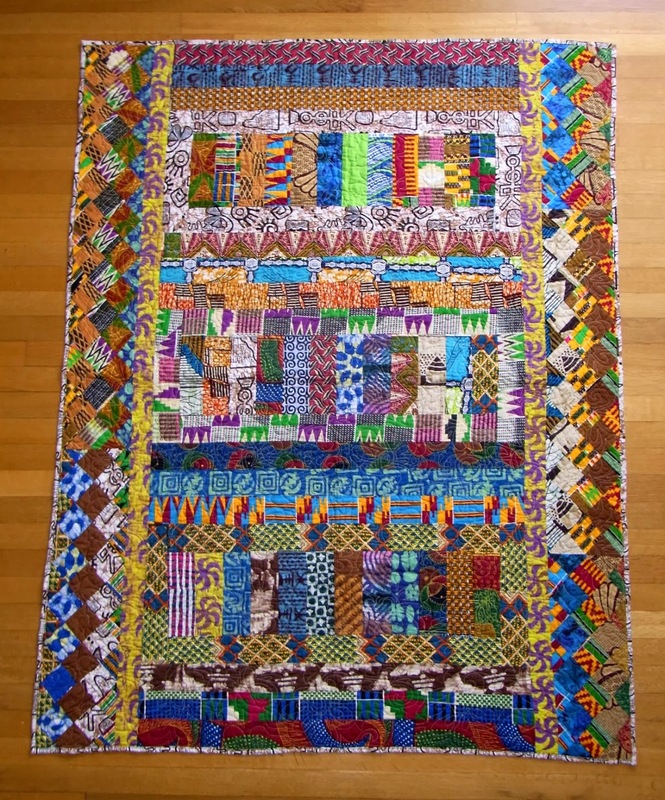 The last picture, below, is to show you the great machine-quilting my friend Mala Ramakrishnan, of Classic Quilts Dubai did. Mala is an amazing quilter & a true artist, so I always felt safe giving her my quilts & saying, "Whatever you think will look best." 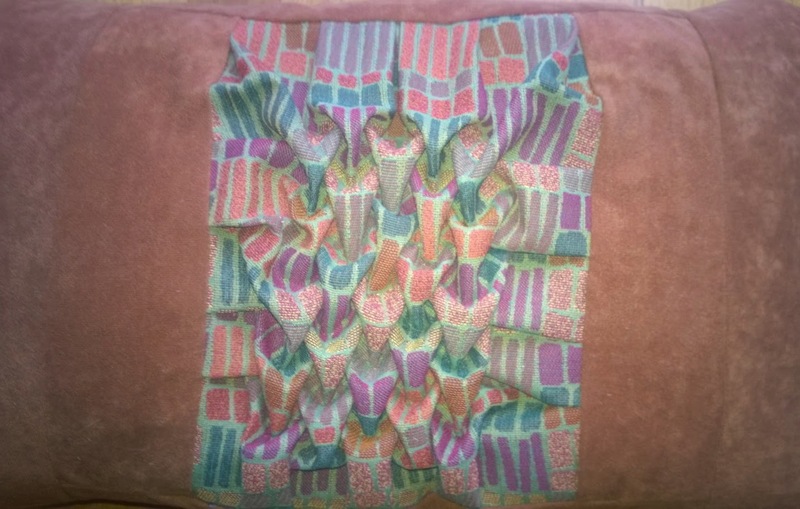 Both are quilted with the same pattern, to make them a matched set, along with the same fabric selections being used in both. We're in the middle of another blizzard right now. Really! 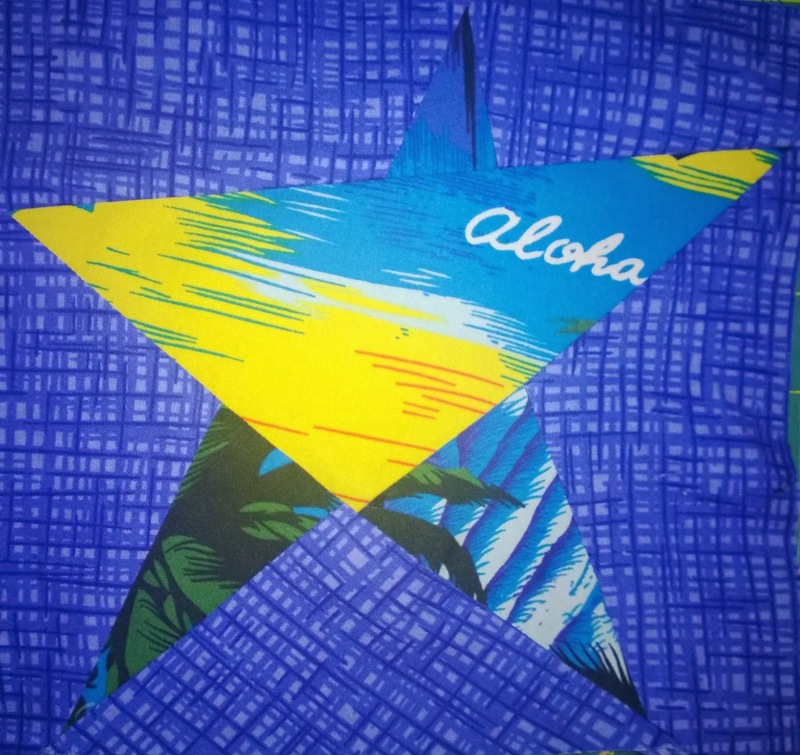 But I'm sewing in the sunshine as I spent much of today working on a quilt made of old Hawai'ian shirts. They were my father's. Though they are fun shirts and the Roommate would wear them...however, he doesn't need them & I think it would be a fun way to remember Daddy, & make something my mom could use, too. Also, they are really pretty worn out & faded. 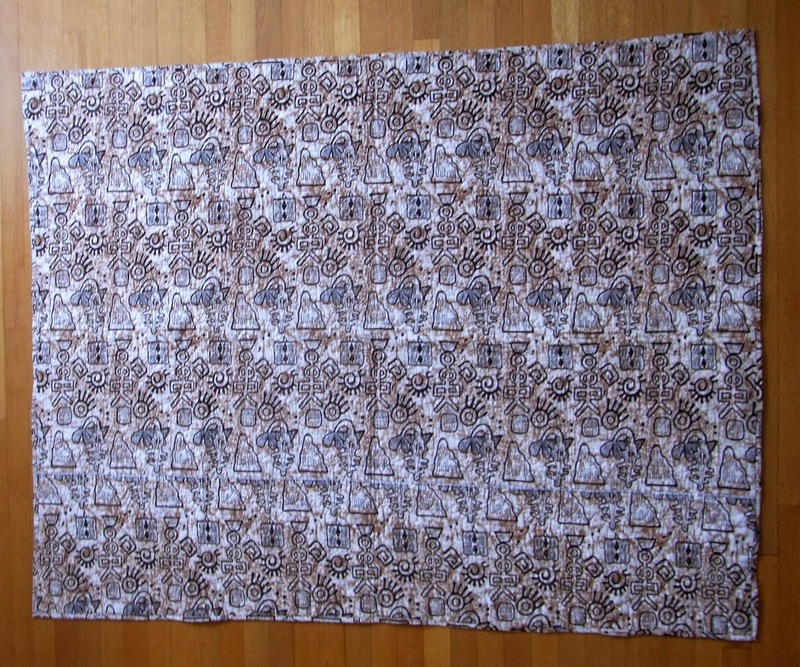 I have 4 of them, so am hoping to get at least a 4' x 6' quilt out of them. I bought a nice blue & white striped flannel for the backing. 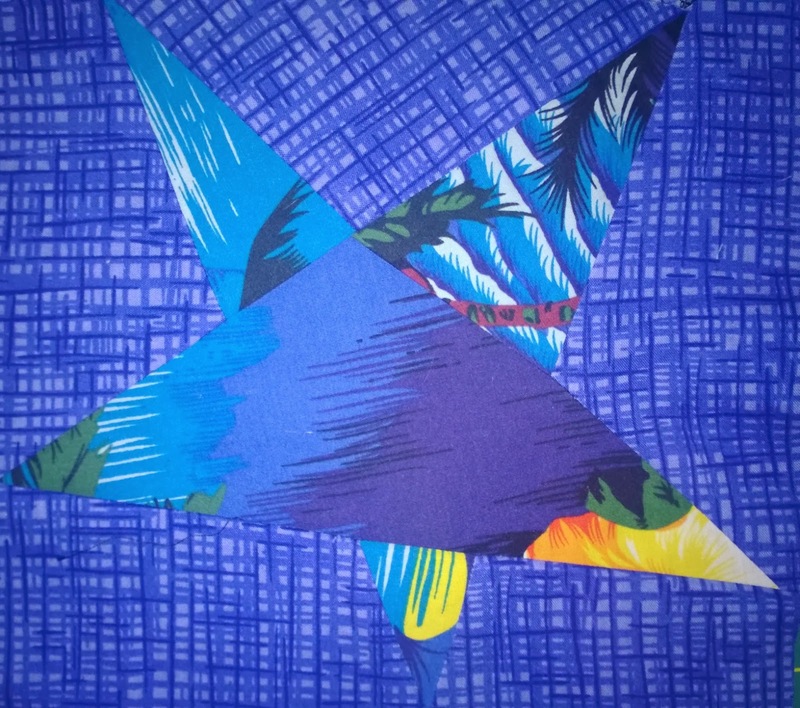 I downloaded Fons & Porter's Love of Quilting: Seeing Stars e-book, and am using the Birthday Stars template. 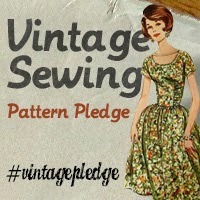 Right now this is a side project as I'm working on something for the #vintagepatternpledge instead...I'll keep you posted as this quilt comes together.